This infinity pool located 57 stories up in the Marina Bay Sands Hotel was recently voted in the top 10 hotel rooftop pools by The Huffington Post – and it’s easy to see why. This pool sits flat on the top three towers, which are comprised of more than 2,500 hotel rooms and suites. While swimming in this stunning pool, you can take in a bird’s eye view of Singapore while listening to chilled out house music played by local DJs, and sipping on a Singapore Sling. Talk about a pool with a view! 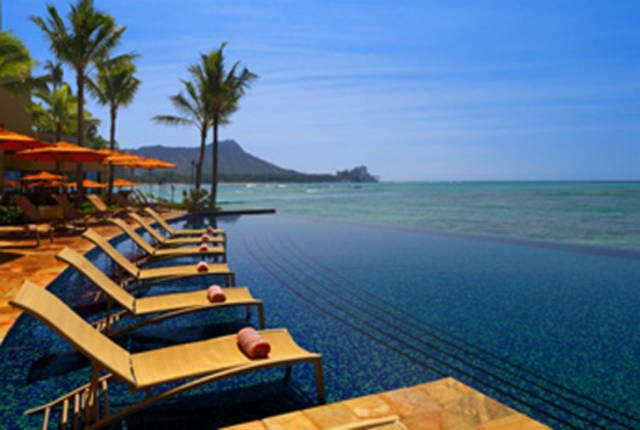 The Sheraton Waikiki features Waikiki’s first infinity edge pool, which overlooks the beautiful blue ocean and a view of Diamond Head in the backdrop. 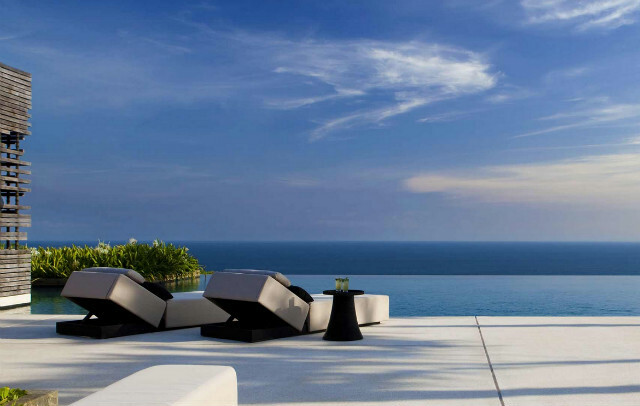 The resort is known for its breathtaking oceanfront views offered from 80 percent of its guest rooms and suites, a first-of-its-kind resort “super-pool” and adult-only infinity pool. This is the perfect place to enjoy a drink and witness a beautiful Hawaiian sunset. Located on a clifftop plateau along the southern coastline of Bali, this calm, emerald-green swimming pool appears to be floating above the Ayung River valley. This pool can be found at Alila Udubu resort in Payangan, which is a traditional Balinese hill village, near Ubud. The view from the pool is nothing short of picture-perfect. 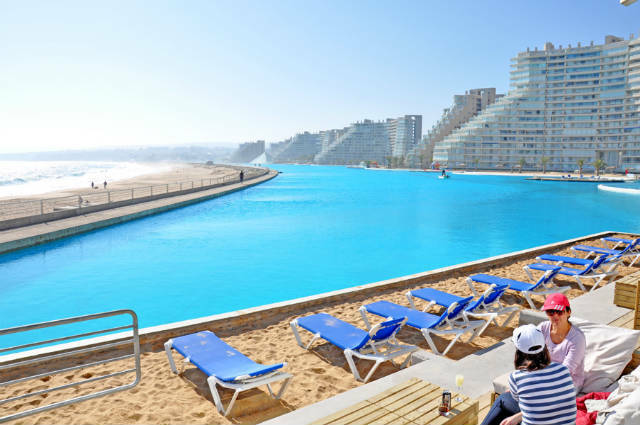 Holding the Guinness World Record for the world’s largest crystalline pool, this impressive body of water is more than half a mile in length and contains 250 million litres of water. Apart from it’s sheer size, this is not the only attraction in this tourist complex: the intense turquoise colour of the water has been achieved as a result of it being pumped, then filtered, straight from the Pacific Ocean. The result? The feeling of a Caribbean Sea at the Chilean central coast. Dreaming of a Greek Island escape? If the picture hasn’t already sold you, we promise you will fall in love with Villa Katikies. 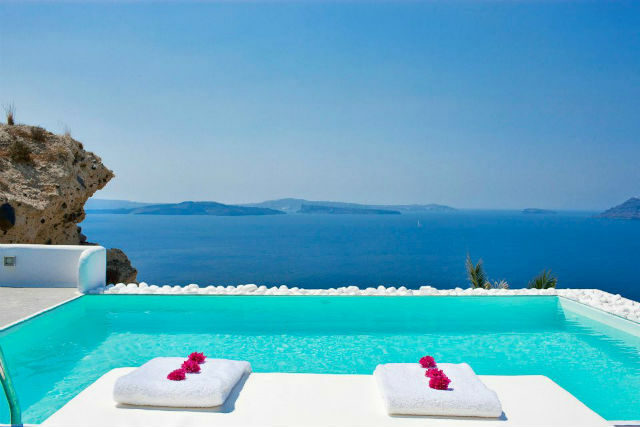 These private villas are set high on the most westerly point of Oia on Santorini Island, offering incredible views across the Caldera basin. The pool and sunbathing deck on the rooftop has a brilliant outlook and lavish decor that will make you feel like a celebrity. Some of the rooms even have private Jacuzzis! If you can’t get into these villas, try their stylish sister property Katikies Hotel, which was awarded the most-famous Small Luxury Hotels in Greece accolade. 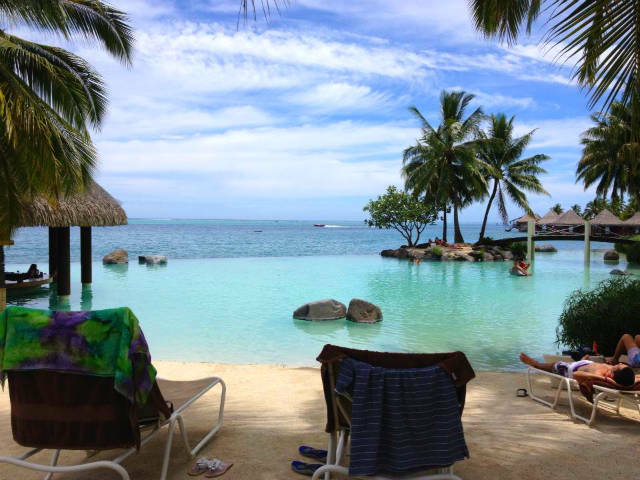 The InterContinental Tahiti Resort has long been rated the top hotel on the island of Tahiti. 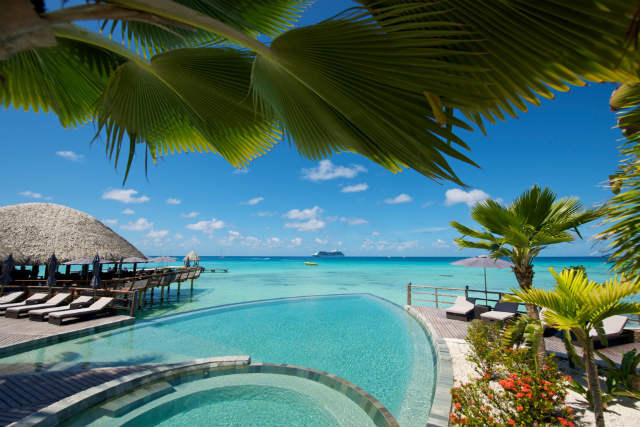 Located alongside the lagoon with a view of Tahiti’s sister island, Moorea, the hotel is located on over 30 acres of flush, full gardens and contains not one, but two superb infinity pools (one being a fresh water sand-bottom pool). Imagine yourself sitting here and enjoying a poolside lunch of the typically Tahitian dish of poisson cru: raw tuna marinated in lemon and coconut milk. Awarded one of the top ten resorts in Mexico by Condé Nast Traveller readers, Dreams Cancun Resort & Spa is an Unlimited-Luxury resort, combining traditional Mayan and contemporary Mexican architecture. 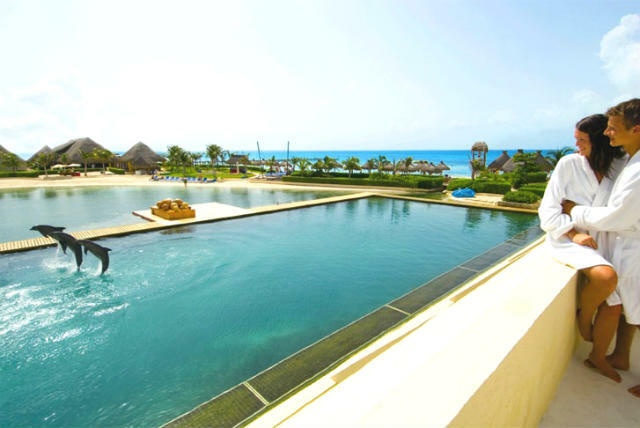 Exclusively situated at the shore point known as Punta Cancun, this is the only resort surrounded on three sides by the brilliant turquoise Caribbean and it’s also the first resort in Mexico with a dolphinarium on site! 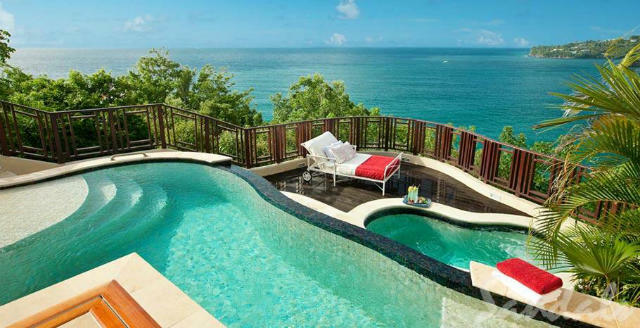 Perched majestically atop a cascading hill with breathtaking views of the Caribbean Sea and a rugged St Lucia hillside, these dramatically beautiful suites offer over 1,000 square feet of pure extravagance. This private pool sanctuary can be found in the Sunset Bluff Millionaire Butler Villas Suite. Looking for tropical paradise? We’ve found it! Tucked in lush tropical landscape and with a crystalline coastline, Shangri-La’s Mactan Resort and Spa, Cebu, is the premier, award-winning deluxe resort in the Philippines. The resort offers two swimming pools amid 32 acres of landscaped gardens. Located on the north-west part of the atoll of Rangiroa, this pool is nestled in the heart of a magnificent coconut plantation, bordered by a white sand beach and a turquoise lagoon. The hotel boasts elegant and refined architecture in perfect harmony with its environment.